It has always been obvious that organisms vary, even to those pre-Darwinian idealists who saw most individual variation as distorted shadows of an ideal. It has been equally apparent, even to those post-Darwinians for whom variation between individuals is the central fact of evolutionary dynamics, that variation is nodal, that individuals fall in clusters in the space of phenotypic description, and that those clusters, which we call demes, or races, or species, are the outcome of an evolutionary process acting on the individual variation. What has changed during the evolution of scientific thought, and is still changing, is our perception of the relative importance and extent of intragroup as opposed to intergroup variation. These changes have been in part a reflection of the uncovering of new biological facts, but only in part. They have also reflected general sociopolitical biases derived from human social experience and carried over into “scientific” realms. I have discussed elsewhere (Lewontin, 1968) long-term trends in evolutionary doctrine as a reflection of long-term changes in socioeconomic relations, but even in the present era of Darwinism there is considerable diversity of opinion about the amount or importance of intragroup variation as opposed to the variation between races and species. 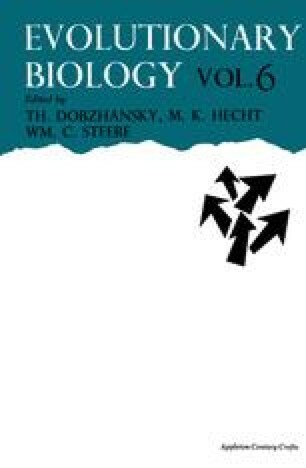 Muller, for example (1950), maintained that for sexually reproducing species, man in particular, there was very little genetic variation within populations and that most men were homozygous for wild-type genes at virtually all their loci.